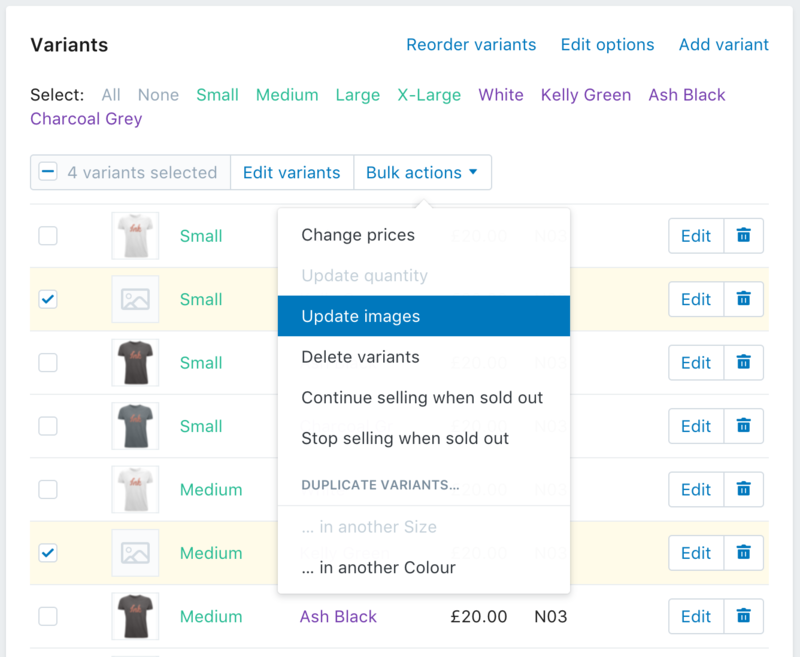 After a product has been exported to Shopify it's very simple to manage it (updating print files or the Inkthreadable product it's linked to, for example) but adding new variants to your product works in a slightly different way. You'll first need to add the new variants in your Shopify admin panel. To get started, log in to your Shopify store and head to your Products page. Click on the name of the product you'd like to add new variants for. We're going to add a new colour to the Ink Logo T-Shirt product. When your product page loads, scroll down a little until you see the Variants box. There are a couple of ways to add a new colour to your variants, but the easiest is the following. 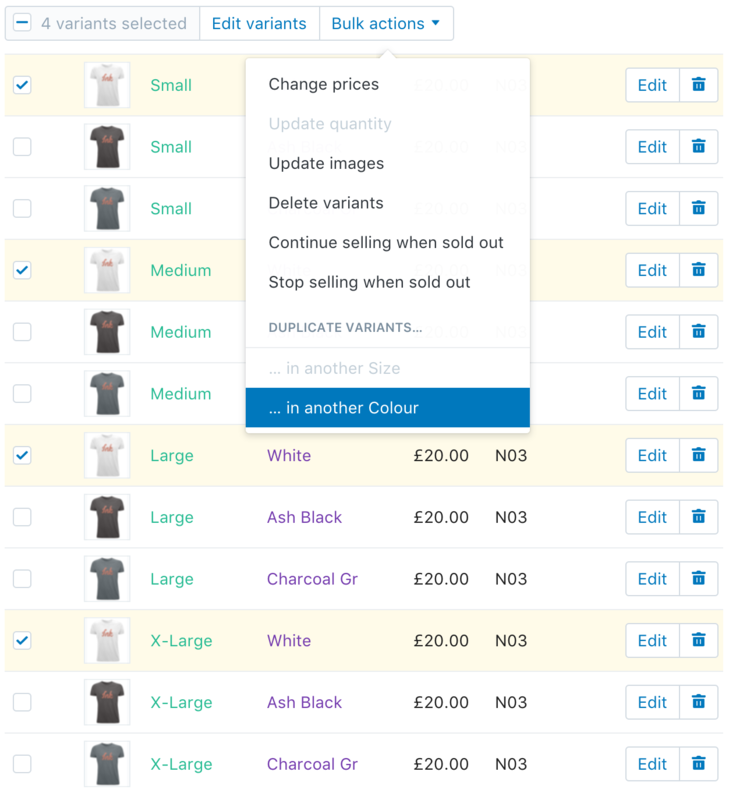 Select each size in an already existing colour variant, click the Bulk actions drop down menu and select the Duplicate variants... ... in another colour option. This will add the new colour as a variant for these sizes. You'll notice, however, that these new variants don't have a mockup attached to them, nor will there be an mockup uploaded to the Images box above that represents your new variants. Before adding a new mockup image to your product page we'll first link the new variants to their Inkthreadable product equivalents. It's best to do this before anything else so it's not forgotten - as it stands the Kelly Green colour variant for this product is not linked, so any orders placed for these variants will not be passed through to Inkthreadable. Stay signed in to your Shopify dashboard, head to the Inkthreadable app and click the Link Products button. 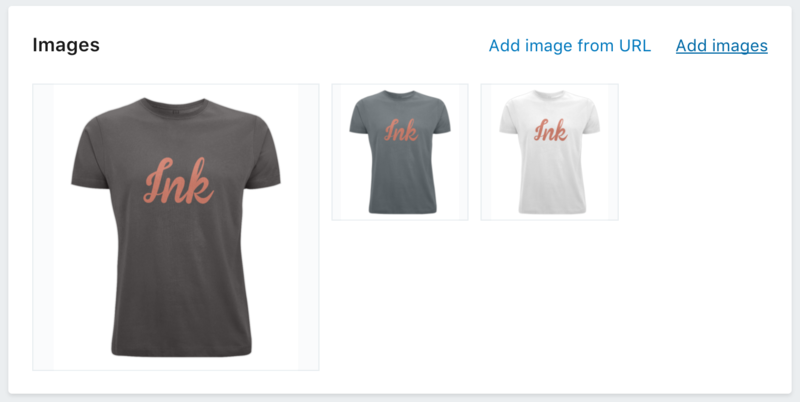 The Ink Logo T-Shirt was fully linked, but since having a new colour variant added the progress bar has dropped to about 75% and has changed from blue to orange. This indicates the product has some variants which aren't linked. Click the Edit button. Since you've already linked some products by this stage you'll likely be very familiar with this page. This is where we link Shopify product variants to their Inkthreadable product equivalents. As you scroll down the page you'll see your new variants are un-checked and not linked to any Inkthreadable variants. Check each of these variants in turn and assign them to the correct colour and size (and don't forget to add your brand labels or alternate print files). Since an orange logo won't look quite right on a green t-shirt we're using a different print file for this variant. To add a different print file, click the Upload button and select the print file you'd like us to use instead of the one already assigned to the product. You'll need to do this for each size variant of the new colour, so in our case the file needs to be uploaded four times (for Small, Medium, Large and Extra Large). Don't forget to click the Save button before leaving this page or your changes won't be applied. The Ink Logo T-Shirt is now completely linked again - the progress bar is now full and blue. However there's one final step: adding a product mock for the new variant. The first step here is to access the product mock for your new variant. The process for this is detailed in another Help Centre article so we won't repeat it here. Once your mockup is saved to your computer you can upload it to your Shopify product page. Navigate back to the product page you edited earlier (when you added the new colour variant). Scroll down to the Images box and click the Add Images link. Select your mockup and upload it. Once completed it'll appear in your Images panel alongside the images previously uploaded. You can then assign this to your new product variant. Scroll down to the Variants box, check each product variant you'd like to assign the uploaded mockup to and click the Bulk Actions drop down menu. The option you want to select is Update Images. Click this an another box will prompt you to select the image you'd like to assign to these variants. Select the image uploaded recently and these variants will be updated with the new image. If your changes are not saved automatically then make sure to click the Save button before navigating away from this page. 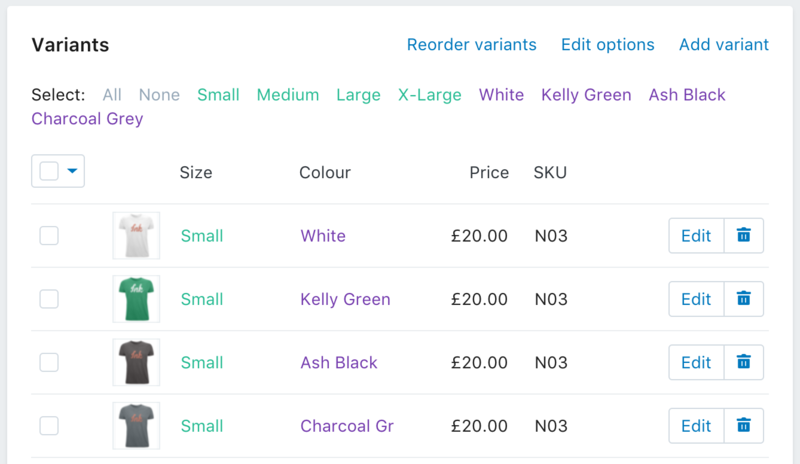 Your Shopify product will now have a new variant that's both fully linked to your Inkthreadable account and has a product mock assigned that reflects the colour and print of the garment.